Mix all ingredients except the baking soda and water. Let stand 10 minutes. Combine the water and soda, then mix with batter. Heat griddle to low-medium heat (2 out of 5 on my stove). While batter is rising and griddle is warming, lightly oil the inside of english muffin rings or large canning bands. Pour about 1/4 cup batter into each ring and allow about 10 minutes to cook. Flip over and allow another 10 minutes. 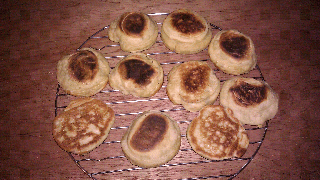 Well, this was my first attempt to make English muffins and the came out somewhat like I had hoped. There is still plenty of room for improvements but they seem like they will work for breakfast tomorrow. When I sliced into the muffins, they had a tight crumb with small bubbles. I think the recipe needs to be wetter. We’ll try it again soon and let it sit over night to see if that improves the texture. The flavors came out a little sweeter than I expected but tasty enough to have another.